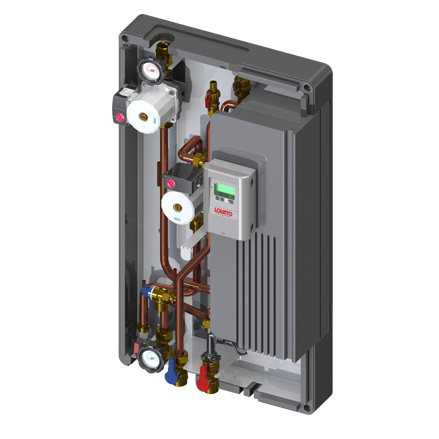 T-FAST-IE 40 is an instantaneous domestic hot water production module that uses the working principle of a stainless steel plates exchanger, that finds a wide use if coupled with buffer tanks. The setting of the domestic hot water outlet temperature (secondary side) happens with the modulation of the primary circuit flow rate through a 3 speed flow pump managed by FWC3 controller. As alternative, variable flow pump controlled by MFWC controller (PWM control). The system, which works with a low primary temperature, finds a wide use in thermal solar systems and in underfloor heating. Is available a DHW recirculation pump kit. • HIGH REDUCTION OF WATER STAGNATION AND LEGIONELLA RISK.